200 in stock Need More ? 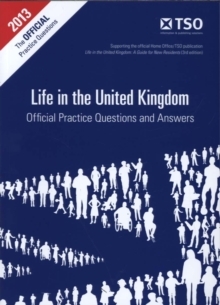 This book does not contain the learning materials for the test and should be read in conjunction with "Life in the United Kingdom: a guide for new residents" handbook (3rd edition, 2013, ISBN 9780113413409) and "Life in the United Kingdom: official study guide (2013, ISBN 9780113413423) which is also ideal for those teaching or learning Citizenship or English as a foreign language in schools, colleges or through courses. Key features of the publication are as follows: 400 questions and answers based upon the official handbook; includes multiple sample tests containing 24 questions each - just like the official test; includes references to chapters within the official Handbook to provide a complete learning experience; includes vital information about how to prepare successfully for your citizenship test including details about the official preparation material, where to book your test, what happens on the day and after the test; includes information about access to the official TSO practice questions and answers website which provides the closest experience to the Life in the UK test.